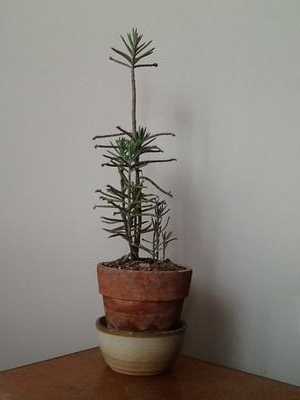 Hiya, any help with the ID on my new succulent would be greatly appreciated. Hi Paul, this is Kalanchoe delagoensis, sometimes called the Mexican Hat Plant, or Mother of Thousands, because of its habit of producing a ton of small baby plants right on the edges of the leaves. Luckily for you, there is little chance that this plant will become a problem, but in warm climate areas, it's known as a noxious weed. In time, they will produce the most incredible flowers, but the plant has to be considerably bigger, and in a much bigger pot, with lots of warm weather to do this. One thing about the way you have planted this plant is does not bode well for the health of it in the long term; they are succulent, and dislike too much water around their roots; allow good drainage at all times, so they don't get root rot. If they look like they need more moisture, then water more often rather than attempt to give it a reservoir (the bowl under the terracotta pot). Thanks very much Jacki, you know your stuff! Hi! I have a plant like this but it keeps growing taller without having a strong stalk to support it! 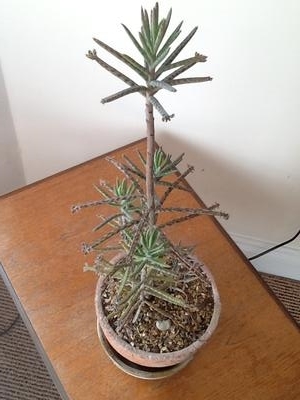 Do I need to put it in a deeper pot so it can grow stronger roots? The best way to get it stronger is actually to start cutting off the top, as long as it's getting enough light (in which case this might be a flower stalk). Bright light is essential to keep it more compact.